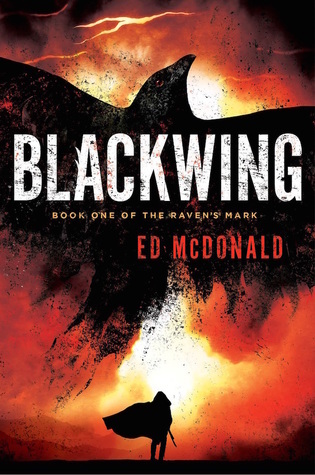 Blackwing is the first in a new fantasy series by Ed McDonald. It’s got a certain kind of noir style. Some of that’s the world – a republic that exists by the sufferance of its leaders, magicians so powerful and remote they may as well be gods, its people used as a shield against an encroaching Empire. Part of it is the characters – like Galharrow, hard-bitten, hard-edged, seemingly mercenary. A man with a keen intelligence, an even keener sense of cynicism, and the pragmatism to do whatever needs to be done – an extremely tarnished knight errant. There’s buckets of gore mixed in with emotional honesty, and glorious and terrible magic sits side by side with some nuanced character moments. Coming into this with no expectations, I can say I was very pleasantly surprised – it’s great stuff. The world – well, I don’t want to overuse the word grim, but it’s certainly not a very pleasant one. The narrative is set at the edge of a border zone. On one side sits a republic, of sorts – governed by a small group of voting ‘Princes’, whose social and economic control is immense, a noble class beneath them serves as landowners, with everyone else lurking somewhere beneath. But above the Princes, sit the Nameless. These eldritch creatures are, if not omnipotent, effectively so from ground level. They fade in and out of society, following their own inscrutable agenda’s, passing on esoteric warnings, and engaging in a grinding war with the other side of the border. As an example of the tone of the text, the Nameless don’t seem to demand the reverence of those in the land they inhabit, presumably for the same reason that the boot makes no such demands of an ant. The Nameless are horrors, to be sure – less actively malevolent than obscure and alien. Their opposite numbers across the border are rather less pleasant. The Nameless have created a physical border, a zone of ghosts and horrors, where directions never quite lead you where you need to go – and the fear that they could do so again is what holds their enemies in check. This is a world of gods and monsters, where the expectation is that they’re one and the same. There’s a grining poverty, a society of inequality and an expectation that life will be nasty, brutish and short. But there’s beauty trickling through as well. A percentage of the population is able to work or store magical energy; some of this is used to power cities, some for rather more military purposes – like large explosions. But the description of a spinner weaving in the moonlight is entrancing, and the moons themselves, setting over the twisting monstrosities of the border – the Misery – almost flow off the page. Into this world steps our protagonist, Galharrow. As alluded to earlier, he is, to be delicate, not a particularly nice man. He’s ruthless, selfish, and more than happy to kick a fallen opponent when they’re down. I think he’d probably prefer it if he could stab them in the back, whilst they were asleep. He has a loyalty to a few long term associates, but seems callously indifferent to the fates of pretty much everyone else. On the other hand, his sense of cynicism is precise, and accentuates rather than masks a ferocious intelligence. Galharrow is smart, perceptive, and his observations, if vicious, are typically pithy, valid, and amusing. I was driven to outright laughter by a few particularly on-point pieces of internal monologue. He has enough humanity to be sympathetic in such a broken world, and enough pragmatic energy that he’s a joy to follow around; watching his struggles with his own humanity, especially when it runs into the obdurately awful world, is captivating. In this he’s backed by an able supporting cast. There’s his able lieutenants, one of whom, Nene is surprisingly sympathetic for a blunt, blood-fuelled killer. The other, an altogether gentler creature, helps navigate the team across The Misery. His gentle vitality and good humour serve in stark contrast to both Galharrow and Nenn. But there’s others here as well. There’s the horrifyingly alien yet curiously compelling Nameless, and their simply terrifying opposition, the Deep Kings. There’s heroic generals, and cowering incompetents, arch-mages and broken peasantry. This is the pageant of life on display in the awful strangeness of The Misery, and Galharrow is our lens into it all. In that regard, he’s perfect – a man determined to be who he seems to be, but not quite fitting into the mould he’s made for himself. He’s not a tortured antihero, but someone broken, making the best decisions they feel that they can – and each turn of the page makes him more alive. The plot begins with a bounty hunt, but it definitely doesn’t end there. Galharrow investigates conspiracies, and acts as the servant of the Nameless, which largely means getting his hands dirty. His investigations are the central core of the text, each thread he pulls on leading toward an explosive conclusion. But there’s red herrings to be worked through first. There’s betrayals and duels, monsters and mages to be fought. Still, if Galharrow isn’t shy of chopping up the occasional monstrosity, it’s his incisive mind driving the plot, trying to tie everything together. This is a story about solving a mystery; it is, of course, also one which doesn’t shy away from an awe-inspiring battle or two, and some wonderfully kinetic and gory sword-fights. There’s enough weird and appalling magic for anyone. By the time I finished the book, I didn’t want it to end – and I’m already keen to see where this series goes next. It’s an impressive work of fantasy, and one I thik we’ll be hearing more about. Highly recommended. The House of Binding Thorns is the sequel to Aliette De Bodard’s extremely well regarded debut, The House of Shattered Wings. The central conceit is that angels have fallen from heaven – short on memories, but filled with supernatural power. Like its predecessor, the book is set in a Paris of the last century, of top hats, tailcoats, salons and oppression. But here, if there is a ruling class, it is those surviving fallen angels. They’re radiant, often charming creatures. Most seem to have a streak of cruelty running through them – and where that isn’t immediately the case, their power comes at a price. This is a broken world, as well. Factions of the Fallen waged war on each other for years before the current situation. As a result, Paris is devastated, broken into enclaves, islands of stability protected by Fallen magic. Between these Houses are magical landmines, absolute poverty, a poisoned river and other, darker threats. If the Fallen have blown apart the city, they are now the only safety from the results. That safety is, though, rather tenuous. There’s enclaves of another culture entirely lurking beneath the waters of the Seine. We had a brief glimpse of their environment in the previous book, but are immersed in it more fully here. It’s clearly a distinct culture, with a ritual and cadence unfamiliar to those above; it’s a vivid and thoughtfully crafted society, with its own customs and mores – but it has the same creeping corruption and decay as is occurring in the enclaves of the Fallen. The interaction between these two societies is fraught with opportunities for betrayal and misunderstanding, at least as much as for mutual benefit; watching characters from both societies try and cross the liminal barrier, the gaps in understanding, is intriguing. 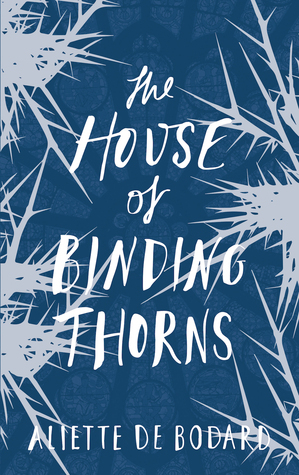 The focus though, is on the House of Hawthorne, run by the razor edged, charming and utterly ruthless Asmodeus. I’ve got a lot of time for Asmodeus. He oozes a sort of chilly charisma, mixed with a willingness to embrace calculated brutality. There’s something about him that speaks of razorblades and blood spatter on dark nights. At the same time, he’s a ruler, with a laser-fine intelligence, and an eye for loyalty. All of these facets bob near the surface, and there’s a feeling that something far darker lurks beneath. Asmodeus is a captivating character, effortlessly seizing control of any scene he’s in, and trying to work out what he was up to, why he was doing it, and what on earth he was going to do next was a great reason to keep turning pages. Madeleine is a returning character from the previous story. She’s fragile, struggling to shake a dependence on a drug which (briefly) provides the user with the powers of the Fallen – and slowly rots out their lungs. She’s self-aware enough to understand her position, and there’s a patina of low-grade fear that pervades her interactions. She’s tied to Hawthorne and Asmodeus, a House filld with horrible memories, and a Head who may not despise her, but of whom she has a well deserved terror. 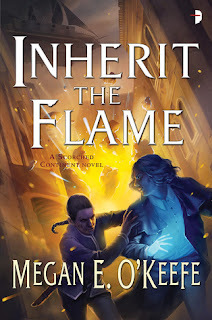 Still, Madeleine is also smart, resourceful, and prone to doing the right thing – in contrast to Asmodeus and his realpolitik, she struggles to do what she things of as both ethical and best. That she may fail is due to the hard edges of the world the author has brought us – the despair of the character seamlessly blending into the society around her. Still, Madeleine shows that if the world is in a state of slow decline, there are still those willing to stand up and be counted, when they feel that they must. They’re not the only cast of course, and I’m doing the rest of the characters a disservice by not approaching them in detail. But if the faces are different, the depth is the same. There’s one of the people of the Seine, slowly infiltrating and acclimatising to House life, and the housebound Fallen who has created a fortress from a cheap apartment, and wants to live to see her wife give birth to their child. There’s vicious killers, and supernatural monstrosities. This is humanity at its worst and best, and it’s mirrored back to the reader in the faces of the supernatural creatures striding the broken streets of Paris. These aren’t saints or monsters, but complicated people, making decisions for their own reasons, worming their terrible way off the page and into your heart. The plot spins itself out gradually, luring the reader into the world with old feuds and magical mysteries. There’s a tension wrapped through the pages, as investigation gradually opens up possibilities – usually unpleasant ones. Quite what’s being done, and by whom, and indeed why – all begins extremely unclear. As investigators pick up leads, clash with each other, and follow their own agenda, the story clarifies – or would, but there’s red herrings and quirky actions aplenty. There’s shades here of Chandler and Hammett, as the protagonists dig into the dirty laundry of the past, with guile and magic masking their humanity (or otherwise) and their frailty. It’s a story which rewards close reading, and one which compelled me to keep turning pages; the climax was rewarding and impressive – and left me breathlessly hoping for more. First, this book is part of a series, which is not immediately obvious from the product description, or the back of the book itself. Each book appears to have been written as a stand alone novel, and I managed to read the entire text happily enough, despite not having read the preceding two novels. Having said that, I believe a reader might benefit from the background I presume lurks in the previous novels, and where I struggled with quickly introduced background pieces, a long time reader would have adjusted more comfortably. The world that has been created is a rich and diverse one, borrowing attitude and some cultural markers from the Napoleonic era, whilst also throwing in steampunk-eque elements - a fleet of airships serving as the only airforce, submarines with chased-lion brass torpedo tubes and elaborate figureheads. The diverse lands and cultures inhabiting the world are carefully drawn, each obviously given a history and life uniquely its own. The characters are perhaps something of a let down - compared to the complex and elaborately crafted world they inhabit, I never got a clear sense of what many of them wanted, and what they were driven by. This was by no means the rule - some of the characters were strongly developed, and I certainly felt that (outside of the antagonists), none suffered from lacking detail. It is really only the comparison to the world itself that makes the characters suffer - and each is unique, interesting enough, and has a role to play. This book is something of an adventure of the old school, with a foot firmly planted in the territory of Edgar Rice Burroughs and his `John Carter of Mars' series, the other wedged in `Sharpe' and `Hornblower'. Events happen quickly, and whilst the first chapters seem a little slow, it becomes clear that this is merely a `slow burn' prelude to the plot-packed sections that follow. Each scene is individually strong, and carries a very satisfactory sense of high adventure. The characters (and the reader) often have little time for introspection, simply because the next crisis is looming, and the reader is kept turning the pages to see how it all ends. This is an excellent adventure novel, a great page-turner, and I heartily recommend it! 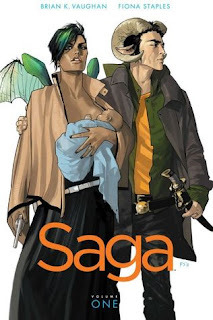 So, today I’m going to do something a little different, and talk about Saga. Or at least the first volume of Saga. For those of you, like me, who are new to the world of graphic novels, Saga is a sci-fi series, which looks at the trials and tribulations of a family whose worlds have been at war for, seemingly, forever. The conflict between two worlds is one of the defining facets of the first volume of the series. Originally a local conflict between two species, it’s become a sprawling war across multiple planets, as the civilisations have evolved. There’s a casual racism on both sides, and hardened attitudes are clear – the divide between “us” and “them” is entrenched and toxic, even though both sides appear to have their fair share of heroes and villains. These super-states have pushed their antagonism out into smaller theatres; their own homes appear unthreatened by violence, even relatively peaceful – whilst war machines grind blood into mud on occupied or ‘liberated’ worlds. As a social fabric, it feels like a call back to the Cold War and aftermath. But if the setting encourages a degree of despair – winged and horned antagonists throwing their proxies into meatgrinders – the worlds on which this takes place are vividly, eldritch places. A forest of trees also serve as a rocketships. Ghosts erupt from the dark woods, and take up child-rearing duties. It’s a kaleidoscope of the imagination, each new idea slotting into the wider fabric – sometimes quirkily, but always blending into the existing world. There’s a lot of imagination on display here, and a feeling of discovery on turning every page. The duo at the centre of the text are rather charming; articulate, often aggravated with each other, a husband and wife from species at war. That conflict seethes around them, but their refusal to identify with it, to be anything other than what they want to be, rolls impressively off the page. Both seem to have their own strengths, but this is a couple which is believably complementary. They bicker and banter with an effervescent charm, but there’s moments of emotional honesty laced through the dialogue, and a feeling of loyalty and trust which is wonderfully genuine. They’re joined by a superb supporting cast - from the robot prince with a ruthless streak, determined to capture our heroes so he can get home to his wife, through the aforementioned babysitting ghost, to the brilliant ‘Lying Cat’, which interjects whenever anyone around it tells a lie. These characters don’t have as much time on the page, but they do feel like individuals, with their own oddities, agendas and quirks. The plot is a journey, of sorts, as our heroes attempt to get off of the planet they’re trapped on, and find a new home for themselves and their soon-to-be-born child. It’s got the occasional moment of violence, but that’s wrapped up in the larger family story, the dialogue shaping a relationship for the reader. There’s a lot of fun stuff going on; the various hunters looking for our couple are tenacious, and have a tendency to walk into odd situations of their own. But this is a story about the characters and their journey across the world – and on that basis, it’s a compelling, perfectly formed narrative. I don’t dip into graphic novels often, but this one was a very pleasant surprise. I’ll be looking out for the later volumes. 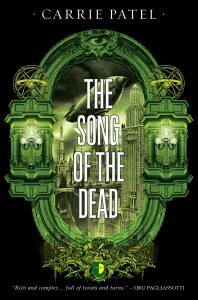 The Song of the Dead is the third and final novel in Carrie Patel’s ‘Recoletta’ sequence. The first two have been great explorations of an enclosed society and its surroundings. Murders have been investigated and governments overthrown. In a series which has also looked to explore choices and, more particularly, their consequences, the conclusion was always going to have a lot of potential promise to fulfil. Happily, it manages to do so. This time around, although we do get some time in the city of Recoletta, it’s not the only focus. Still, it’s great to go back to the underground city again. This is a claustrophobic space, one where history has been captured and maintained by the government, and where stasis has been an effective way of life for generations. Broken apart by successive coups, Recoletta is now on a knife edge between savagery and civility. The old order has been cast aside, but nobody is quite sure what will replace it. But if we saw Recoletta in the first volume of the series, and the immediate environs in its sequel – well, this is the book that takes the characters (and the reader) into the wider world. There’s several new social constructions here – a cosmopolitan, close knit nation of travellers, their eyes turned inward is one, its acceptance of the wider world a stark contrast to the Recolettan paranoia, its lack of integration with other social groups depressingly familiar. Across the sea though, lurks something very different; here is a vast civilisation, one with a high degree of technical prowess, and a relatively open society. But it’s also a society defined with a fear of the Other, replacing the enforced isolation of Recoletta with something more ideological. Both of are internally consistent, sharply, vividly drawn social spaces – a pleasure, of sorts, to explore. The characters – well, there’s some familiar faces returning. Liesl Malone returns, and she still has her dour, pragmatic charm. She’s still an investigator at heart, a woman comfortable on the streets, in action, and with a blunt personal honesty which can pass as charisma in the right light. If she’s changing, it’s in becoming more aware of the larger consequences of her actions, in a stronger will, and in a growing distaste for authority – in both assuming it and being controlled by it. This latter trait she shares with Jane, once a laundress, and now a survivor of the turmoil of Recoletta’s recent months. Jane is quick, persuasive, and perfectly willing to lie through her teeth in order to achieve her goals. Where Malone works within the frameworks of society, driven to fix the problems she discovers, Jane is determined to change that society, or, at least, to escape from it. She’s a fiery counterpart to Malone’s stolid focus – and when they’re both on the page at once, it’s an absolute delight. The bickering, the low level distrust, the simmering dislike – all comes together to make an unlikely duo, whose exploits are both fantastic and ring true. Though these two are the focus of the text, there’s a swathe of supporting characters here. Some are familiar from the previous books, others are new. The villains are sympathetic, their motivations somewhere between grey and genuinely good. If the reader finds their methods monstrous, it can be difficult to argue with the problems they identify, and the issues they’re struggling against. It’s nice to see this sort of ambiguity, our heroes not avatars, our villains not slavering fools – both instead sitting in the broad spectrum. This makes distinguishing “villains” rather difficult, which I think is something of a benefit. In any case, the antagonists our protagonists run across are certainly complex, convincing characters. The plot – as ever, no spoilers. But it’s got something for everyone. There’s the great secret of the Catastrophe, which shattered the land above Recoletta. There’s air battles, train robberies, betrayals. A whiff of the romantic (as well as of romance) runs through the pages, and if Malone and Jane seem to plunge from the frying pan into the fire quite often – well, it certainly kept me turning pages. There’s some great character moments here, as well as some smartly written dialogue – and the plot runs along nicely. It kept me guessing and kept me reading late into the night. If you’re looking to start a new series, then it’s worth going back to The Buried Life and working your way through the series. If you’re looking for a conclusion to the story of Recoletta, then I can recommend this wholeheartedly. The Malice is the second book in Peter Newman’s “Vagrant” series. The first, the eponymous “The Vagrant” was one of my favourite books from 2015, so the sequel had rather a lot to live up to. In short, it delivers – a vivid world, some charming characters with believable development and emotional heft, and a plot which carries both choices and consequences. The world is changed a little from that of the first book; then a southern continent seething with demonic forces and broken cities looked to overcome an empire in the north, sclerotic and hanging on to ancient high technology. Now, well, things are different. The Empire of the Winged Eye still holds a line, its people kept safe from mutations by hardened technology, repressive government, and slightly worrying social mores. The Empire sees the creatures that have entered this world as abominations – and the half breeds, those warped by the touch of the Infernal, as deficiencies to be cleansed. But things have changed in the South. There, the monstrosities once united under the Usurper are intent on maintaining their own petty kingdoms. Each is a combination of horror and vitality. If the twisted monstrosities that rule them are petty and often cruel, those that survive within their fiefs have the energy and drive surely missing from the Empire of the Eye. Each of the surviving enclaves of demons has its own flavour – from the broken, slowly decaying sky-fortress of the Man Shape, to the distributed consciousness of the First. Each is repulsive, but carries its own strengths. The half-breeds have their own places too, carved out of the journey of the Vagrant in the previous book – struggling to hold together a hard-fought integration between mutants and those that feel more normal, trapped between the judgments of the Eye and the Infernal. This sort of integration, the gradual collapse of the Infernal into something recognisable in the realms of the human, is one of the avatars of theme running through the narrative – an enemy is not eternal, a foe can change, and if that mutability does not guarantee shared interests, still, it’s something to be recognised. In any event, the South is no longer the behemoth it was, and if it is less terrifying for it, it is perhaps somewhat safer. Both the Infernal and the Eye are wonderfully drawn creations, societies with drastically different underpinnings that spin out in their interactions with each other at the macro and micro level. The soaring sky-ships of the eye are of a piece with their casual dismissal of the half-breeds as tainted, and the acceptance of the Infernal for all kinds is wrapped up inside their mercucrial cruelty. Neither seems like a particularly good place to live, but are living, even thriving social constructs. This is a world which can leap off the page, sink fangs into you, and never let go. The characters – well, we’ve shifted generations now, from the mute soldier of The Vagrant. His daughter carries his sword now, the one which once belonged to one of the rulers of the Eye, now dead and broken. Barely out of childhood, she takes up the sword with a desire for action – and discovers that everything is rather more complicated than she might have liked. If the Vagrant was an avatar of stolidity, duty, movement, then his child is a figure of innocence, facing up to a world which disdains that quality, and demanding its respect. She’s charming to walk alongside, is Vesper – a person with a moral integrity, a sense for what is right, which contrasts with the more soiled figures who surround her. She has a friend, of sorts, a guardian – who, in the interests of spoilers I’ll only suggest is broken, both by the circumstances, and by their conception, and, of course, she has a goat. But Vesper is at the centre of the triad; this is partly a coming of age story, as she realises the duties and sacrifices she may have accidentally put on when she took up the sword. But it’s also a tale of exploration, a journey of discovery intermingled with horror and delight – and seeing Vesper grow, not into the role expected of her, but into the one she chooses – is marvellous. There’s some absolutely marvellous villains here as well, of course – repulsive demons, shifty black marketeers, and more. There’s also a marvellous supporting cast; I’m particularly fond of the creature living within the shell of one of the Kinghts of Jade and Ash – no longer an elite unit of infernal killers, no longer yoked to the will of their commander. Instead, this individual is trying to work out what – and who – he is, and that journey is as compelling as Vesper’s – ash she moves to maturity, he wavers toward humanity, of a sort. The plot – well, it’s a journey, as Vesper sets out with Gamma’s sword to close the Breach. To, in theory, seal off the Infernal from the world. It’s a story of her climb into adulthood, of sorts, and the story of a search for redemption. There’s exploration of the history of the Breach, of the creation of the Empire of the Winged Eye, and the sacrifices demanded thereby. There’s history here, and there’s sacrifices aplenty – personal demons fought and conquered, or succumbed to – and more literal demons likewise. This is a story of integration, and of consequences – and it’s a cracking read, as well. Sorry guys, nothing today, I'm rather ill. 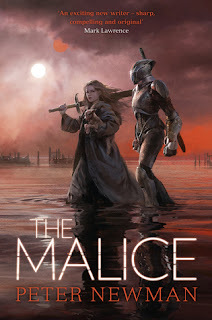 I do have a review of Peter Newman's excellent The Malice almost ready to go, so that ought to be with you by Tuesday. 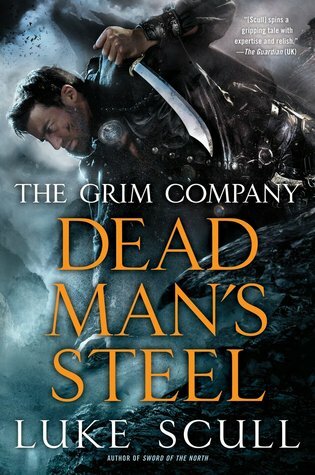 Dead Man’s Steel is the final instalment in Luke Scull’s “Grim Company” series. The first two were unflinchingly grim, with an undercurrent of humour inside a vibrant, if unpleasant, world. The setting is largely familiar from the earlier books. There’s the outright terrifying city of the White Lady, for example – where the population are relatively safe, relatively happy, and not exactly oppressed. They even have a ruler who appears to care about their wellbeing. On the other hand, they have law enforcement composed of the snake-like, silent and disturbing constructs of the Lady, and they also have some rather worrying gaps in their memories. Then there’s the forested areas to the north, nominally run by the Shaman, a Magelord who believes in allowing strength to define what is right. Conveniently for his philosophy, he’s the strongest person in a large area. But the north is riven by war, one side backed by dark magic and demons. If the other is better by comparison, they’re still no charmers - their ranks split by blood feuds, their leaders disunited. There’s some less familiar areas as well; the broken city of Dorminia, for example. It’s been the home for our heroes since the first book, but now it’s a shattered remnant of what it was, populated by feral urchins and wild dogs. It’s also populated by a mysterious and powerful force, which seems determined to wreak havoc on the denizens of the city – and indeed the rest of humanity. We also get to journey into the mountains – which mixes the delights of cold, clear air and all the space you might want with, well, all the demonic entities that you could want. This is a world teetering on the edge of destruction – torn apart by the death of gods, and the rise of Magelords who are, at their best, rather unpleasant, and, at their worst, downright natural disasters. The atmosphere suggests the presence of a precipice, a point of no return inching closer with every page. Our protagonists, at least, are familiar – though many have progressed since their initial appearances. Davarus Cole, for example, is no longer a brash young man determined to do great deeds. Now he’s a tormented, damaged individual – a man who has done great deeds, and discovered their cost. His relationship with Brodar Kayne, the old, tired Sword of the North, remains a delight; even though the two aren’t often on the page together, seeing Cole earn his way into some of Kayne’s weary cynicism makes for a great read. Kayne himself is still exhausted, broken down by his own age, and the need to defend himself against his past reputation. As we go into this final part of the narrative, he’s coming to grips with the idea that he may not have made the best choices up until now – and trying to work out both what he wants, and how to achieve it without an old enemy stabbing him in the back, a new enemy stabbing him in the front, or a demon biting his face off. There’s also the redoubtable Eremul the Halfmage, whose tone has always got a smile from me. He’s ferociously intelligent, viciously sarcastic, and although wary of those in power, prone to saying exactly what he thinks. Usually with some wonderfully colourful phrasing. Eremul is struggling to decide whether people are all terrible; as a man struggling without legs, a terrible reputation as a traitor, and a small amount of magical power, he’s prone to seeing people at their worst. Watching him struggle to understand kindness, and possibly love – well, it’s an experience. An eminently believable one, layered in personal conflicts and tensions. There’s other members of the cast of course; I particularly enjoyed the return of Eremul’s manservant Isaac, now in something of a different role. The villains are variable – the demons seem rather flat in their malevolence, without much to make them anything other than the forces of darkness. By comparison though, both the leader of the aggression against the Shaman in the north, and the new occupiers of Dorminia in the south are complex, well-realised individuals. If their goals are to be regarded with horror and suspicion, their self-knowledge and the logic that led to those goals are not. There’s grey areas here, a certain complexity which means that even if the enemy aren’t to be rooted for, they can be understood. The plot – well, it’s the last in the series, so I’ll avoid spoilers. But there’s more than the standard soupcon of resolution here. There’s several stormingly epic battles, kinetic, driven things where it’s difficult to put the book down, in case you miss someone getting an inch of steel in their eye. There’s duels – elaborate, byzantine, bloody things, with all the technique of world-class ballet, and all the heft of a battle axe in the face. The fate of the world is thrown up in the air more than once, and quite who will catch it as it comes back down is open to question. This is a world where everyone is vulnerable, and where the systems that shape the world are personal ones. It’s a fast-paced story, and one which rewards careful reading with excellent characterisation and solid worldbuilding to go with the battles, the sacrifices, the moments of heroism and the acts of villainy. Is it worth reading? If you’re coming to the series for the first time, I’d say stop, and go read The Grim Company first. On the other hand, if you’ve come this war with our mismatched band of adventurers, then yes – this is a cracking conclusion to a series that you’ll want to see through to the end. 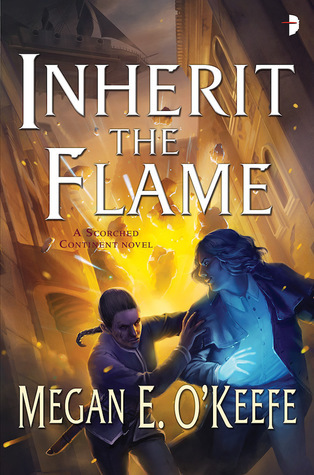 Inherit the Flame is the third and final volume in Megan O’Keefe’s ‘Scorched Continent’ trilogy. 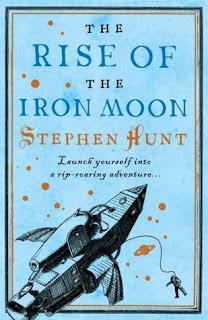 The first two books were a buccaneering adventure, with airships, magic banter, and even some personal growth. They were a lot of fun to read, so I came into this conclusive part of the trilogy hoping that it was going to pay off. The centre of the text is Hond Steading, the home of the charming and at least modestly tormented Detan, one of the main cast of previous books. The Steading, built into the side of a dormant volcano, is the centre of power for the continent, now trapped in politics and geography between a resurgent Empire, and their rebellious commodore, a woman with an iron will, and an agenda of conquest. The Steading is a thriving place, and seems, in comparison to the frontier settlements and prisons we’ve seen previously, positively metropolitan. The populace are opinionated, and have an interest in the arts. There’s public meetings in a new civic forum, where anyone can speak should they desire. But there’s a sense of fragility here as well – the Steading is a soap bubble, waiting for one of those that covet it to risk the wrath of the other, and that time I fast approaching. Still, there’s an elaborate palace, where Detan’s family has ruled for generations, and the population has a dynamism and an energy not seen to such effect elsewhere. There’s hints of the broader picture as well; the Empire is in an abruptly expansionist phase, and if nobody is entirely certain why, the hints of what is moving that larger body politic into warfare maintains the pressure which helps drive the narrative forward. In amongst all the politics and occasional stabbing, there’s also time to look at the sensitivity to the ‘sel’ substance which produces the magical effects that we’ve seen in the world – from thundering explosions to shapeshifting. Sel is something of a mystery, to both the world of the text and the reader, but it’s one whose depths will be plumbed here. Most of the characters are fairly familiar from their previous outings. It was lovely to see Ripka, once head of law enforcement in another city, try to get used to being a civilian again. Then there’s Detan himself, whose efforts to avoid causing calamity have moved past fear into acceptance. His desperate and often despairing attempts to gain control of himself before he destroys anyone he loves are fraught and poignant. That they’re often masked by banter which can often raise a chuckle is a benefit – even as it reveals a character papering over their own mental cracks. We do get a little more understanding of previous antagonists here as well. There’s the Commodore, sometimes known as Throatslitter, a woman who has spent the last two books as a force of nature, capturing cities and towns for a design of her own devising. But she has her own pains and motives, and in discovering what they are, there’s the chance to grow some sympathy, as she moves into a more morally grey area. But there’s other villains here, cold-eyed pragmatists and terrible zealots – and all of them make the blood run cold. The plot – well, it hits a few different beats, often rather well. There’s the suspenseful journey that Ripka makes as she attempts to pin down and eliminate whatever scheme the Commodore is plotting to take over Hond Steading. There’s Detan’s struggles with his power, the responsibility which comes with it, and the need to put himself in the thrall of his enemies to learn control. But there’s also the overarching narrative of conflict and control, as the Steading tries to remain whole in the face of two irresistible forces. There’s some great chases, explosive, horrifyingly grand uses of magic and cracking dialogue too. Is it worth reading? If you’re new to the Scorched, I’d say go back to the first book in the series and give it a go. If you’re already a fan though, this is a worthy conclusion to the series, though ti may leave you wanting more.